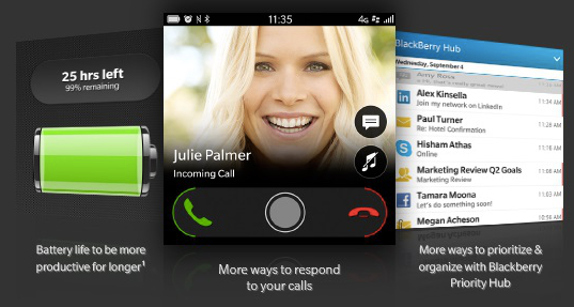 BlackBerry 10.2.1 update getting pushed out starting today for the Verizon version of the BlackBerry Z10, let's take a look at some of the new features that will be coming with the latest BlackBerry 10 build. First, the BlackBerry Priority Hub will learn all about you, curating your important emails, calls, IMs and notifications. This allows you to quickly receive those communications that are important to you. The BlackBerry 10.2.1 update includes new battery monitoring tools and usage indicators that help you manage battery life better. The update also gives you more options to respond to someone trying to reach you. You can now send a text, email or use BBM to reply to calls. To make responding to text messages and email a lot easier, the update allows you to set up different SMS and email groups so that you can communicate with a large number of people at the same time. And notifications on the lock screen are now actionable, so you can quickly respond to someone without having to unlock the phone and open the appropriate application. Among other new features coming with the BlackBerry 10.2.1 update is an option that allows you to save a website for viewing later, while offline. Those with the BlackBerry Z30, BlackBerry Q10 and BlackBerry Q5 will be able to use their handsets as an FM radio, even when not connected to a network. By the end of next month, all U.S. BlackBerry 10 users should have received the update, which is also rolling out to other countries and regions like Europe, Canada, the Middle East, Africa, Asia Pacific, and Latin America.